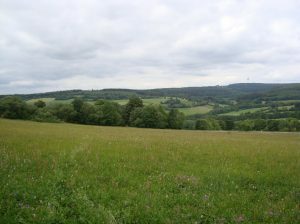 This “Mountain hay meadow” (NATURA-Code 6520) is situated at a north-facing slope in the subdistrict Herchenhain in the east of the nature protection area “Ernstberg”. Usually the grassland is used for making hay by one cut per year. Here and there the vegetation is influences by wetness. Dominant plant species are Festuca rubra, Deschampsia cespitosa, Sanguisorba officinalis, Geranium sylvaticum, Knautia arvensis and Lotus corniculatus.